PRAISE FOR THE WHEN GOD HAPPENS SERIES "Reading When God Happens is like receiving an intravenous dose of hope in a world parched by hopelessness. It will remind you not just to hope for miracles but to expect them." -- Melanie Hemry, Guideposts magazine writer and author of fifty-four books "A powerful read." -- Dimas Salaberrios, author of Street God "True stories like these require those who don't believe in angels ... to explain the unexplainable." -- Cal Thomas, syndicated columnist A diesel mechanic is smashed under the weight of a logging truck. A child's inner tube is sucked out of a peaceful stretch of water into a frothing patch of dangerous rapids. A woman searching for peace is met with an icy chill when she begins arranging runestones.... In all these stories, there is one common thread--God's angels are waiting and ready to powerfully intervene. 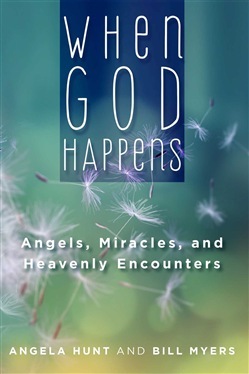 If you have ever doubted the presence of angels or questioned whether God is still acting through them, this book will inspire you to look beyond your everyday perceptions. In the follow-up to their 2018 title When God Happens: True Stories of Modern Day Miracles, bestselling authors Angela Hunt and Bill Myers invite you into the miraculous--sharing nineteen true, firsthand testimonies of angelic appearances, perfectly placed protection, and unforeseen interventions that will encourage you in your faith and cause even the most skeptical minds to take a second look. Hear from a father whose family was saved from back-alley cutthroats by a mysterious Scotsman, a woman whose spiritual battle was inexplicably resolved through a tattooed pickup driver interested in potted plants, and a newlywed home economist whose generosity to an unexpected visitor transformed her life. If you have ever doubted what angels are, where they come from, or how God is working through them today, we pray these stories will open your eyes to the mighty work that is done when God happens. Acquista When God Happens: Angels, Miracles, and Heavenly Encounters in Epub: dopo aver letto l’ebook When God Happens: Angels, Miracles, and Heavenly Encounters di Angela Hunt, Bill Myers ti invitiamo a lasciarci una Recensione qui sotto: sarà utile agli utenti che non abbiano ancora letto questo libro e che vogliano avere delle opinioni altrui. L’opinione su di un libro è molto soggettiva e per questo leggere eventuali recensioni negative non ci dovrà frenare dall’acquisto, anzi dovrà spingerci ad acquistare il libro in fretta per poter dire la nostra ed eventualmente smentire quanto commentato da altri, contribuendo ad arricchire più possibile i commenti e dare sempre più spunti di confronto al pubblico online.